I attended a debate in Marijampolė, the seventh-largest town in Lithuania, which was an occasion to visit this town for the first time. As a regional center of Lithuania’s historically most affluent region, Suvalkija, it continuously appeared in school textbooks. Many prominent writers and Lithuanian independence activists were from this region and had studied in Marijampolė. Still, I couldn′t have named any major landmark. It was not a part of the itinerary of high school trips either. Still, the town has a very interesting history and is worth exploring. 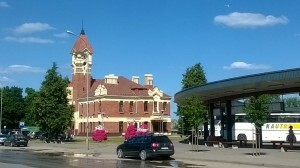 Marijampolė′s predecessor town was known since the 17th century. Its name is derived from Marian monks. The region′s location made it an important trade and cultural center, one of the hubs of book smuggling when writing in Latin alphabet was forbidden under the Tzarist regime, and the first region were serfs were liberated. Therefore it was the first to develop a middle class. I had certainly heard of Rygiškių Jono high school, but I still couldn′t say who exactly it is named after. Many famous people studied there – as one can see, only one woman is listed on this plaque, and in fact there are calls to remove her from the ranks of ′canonized′ Lithuanian writers because she was a Communist. Historically the town was home to several industries, such as sugar and textiles factories and a transport hub. Now sugar and meat production are in the hands of a large and powerful conglomerate, Arvi. The owners of this business are keen on sponsoring arts and culture, and it seems that quite a few of new monuments and cultural events are brought to the citizens by this conglomerate. As I walked down Kauno street (many roads in smaller towns are named after larger cities that these roads lead to, in this case Kaunas), I saw few people in general, but, remarkably, quite a few were cycling on comfortable bike lanes, much better than in Kaunas and in many places in Vilnius. I saw that the town′s cinema, called Spindulys, was looked somewhat empty, but after all, it was a summer day, and there was an interesting exhibition inside about people with mental disabilities living in care institutions. I then crossed the main square, named after editor and Lithuanian independence activist Jonas Basanavičius, where I saw that there were two large umbrellas put up by the municipality for residents to enjoy a shade. On the other side of the square there were fashion stores and familiar coffee brands. Close by there was a cultural venue for concerts, with posters for an upcoming jazz gig. 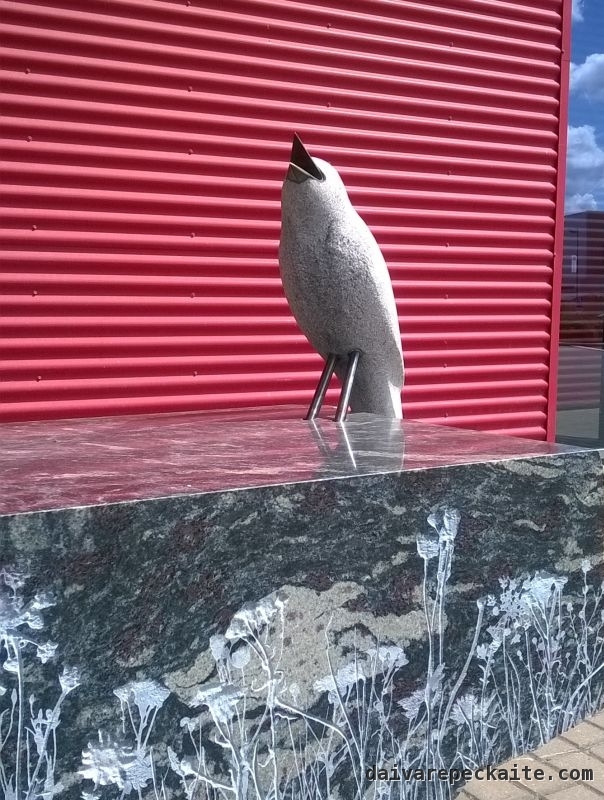 I didn′t see many sculptures, but this bird is my absolute favorite. Like many towns, Marijampolė has received EU funding to kick-start some changes in its urban texture. Some of the roads, bike lanes and sidewalks were being renovated. As I later walked to the station, I could see how a pleasant town morphs into something village-like, with gardens and greenhouses. 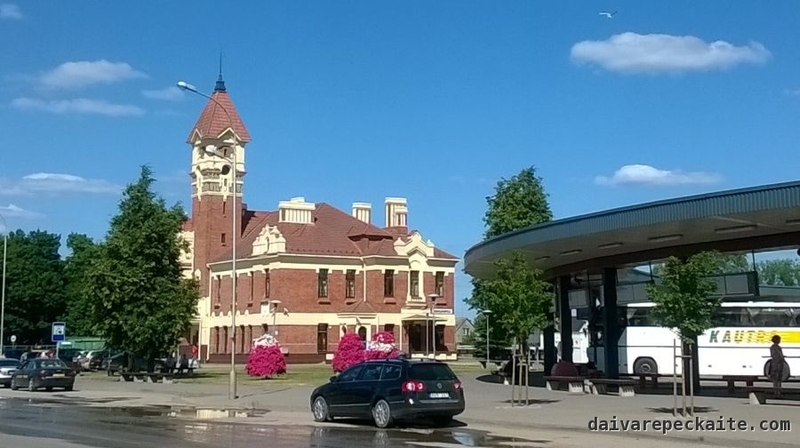 Marijampolė has a very beautiful train station. Buses and trains stop at basically the same place. After Rail Baltica is completed, there will be a direct railway link from Tallinn to Berlin, and Marijampolė will be one of the stops. One of the locals complained that the railway will cut across the town, and construction work is already very noisy. Right now the station is kind of dead. What was quite striking about Marijampolė was that it is one of these towns where people can immediately tell that I am not from there. The region has a distinct accent, and although standard Lithuanian is based on this dialect, I do not feel such a difference between Vilnius, Kaunas, Klaipėda, Alytus and many other towns. Here signature long vowels and a different way to construct diminutives make the dialect immediately recognizable. All in all, it is a pleasant town to visit on an occasion of something. It’s only an hour from Kaunas, and once the high-speed railway connection is complete, it might take even less time to visit it.